I like this receiver very much. It has back panel conveniece outlets (100 watt unswitched), a tape monitor loop switch, and mutes the sound briefly when switching inputs for reliability. I believe other comments concerning reliability and hiss are just unfortunate occurances in an otherwise well built reliable unit, and are not typical of the unit that you would probably receive. Its' best feature is the sound which is very listenable and musical allowing one to enjoy the sound for hours without interruption. It is a bit bass-shy in the lower octives when compared to receivers fron Onkyo and Yamaha and does not have a low inpedance design. I can't comment on the competition in this price range but do feel it is an excellent value and that you really wouldn't go amiss purchasing this unit. Overall, 5 stars. I bought this becaue I run an outboard equalizer and this unit has a "tape monitor" button which allows me to loop the EQ through the receiver easily. Sound is great, without a lot of frills. The A/B speaker selector switches are the only downside. When A + B is selected, the receiver routs each pair in series to prevent the load impedance from dropping too low. I have remote speakers that are substantially different than my main speakers and, when selected with A + B , the lower efficiency pair drops drastically in volume. I ended up configuring an external A/B selector switch that maintains 8 ohms even with both sets of speakers selected. Along with a stereo L-pad for the more efficient pair that I was using before, the balance is just fine. It is well worth the money!! This receiver is just what I needed. I don't need massive wattage or power, but something that had enough 'oomph' to shake the floor if necessary. I purchased this and a Technics turntable along with some Sony speakers. What a joy it is to listen to my vinyl records again. The volume at 25 or 30 is more than enough. The phono input is clean, my records sound crisp and warm. I play my iPod through this, and it sounds great. I almost can't tell the difference in sound quality between MP3s and my vinyl. Some of the albums that were recorded DDD sound immaculate on this system. It's been a while since I had a full home stereo set up, so it's nice to have this at a great price. Jazz, reggae, electronic, hip hop, metal and punk - all sound great (yeah my musical taste is broad). I'm not reviewing this product with the audiophile in mind (as I am one, but in this case, not worried about the stylus brand, the wattage or ohms etc). It's just a solid amp, with clean sound. Add a nice teac equalizer and I'm happy. I can crank Public Enemy, Mastodon, The Jam, John Coltrane or the Minutemen - it all sounds great. Recommended highly for those who want a simple set up. Just what I wanted. Nothing fancy. 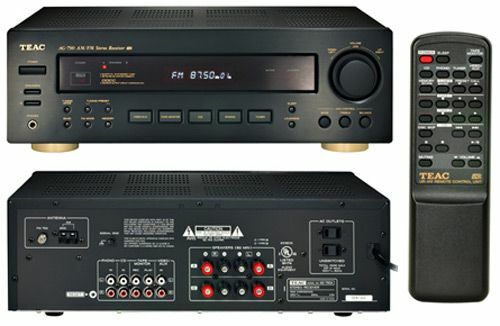 Just a basic two-channel receiver that sounds good at all volumes. Picks up a ton of AM and FM stations. Good receiver for a great price! Good sound for the price. I just needed a receiver for my bedroom. The sound and features are perfect. I'm more than pleased. I am age 53 (in 2009)- a child of the component stereo age- and I like it that way. I did not give up my albums... I just added CDs. Wish it had a built-in Equalizer, but I can add that component later. If you're not after a "Home Theater" unit, this is the stereo unit for you. I've worked many AV applications. I purchased this economical receiver for a boardroom to power three ceiling speakers. My requirements were (1) the sound quality and (2) our non-technical assistant needed to be able to turn it on. It worked great in both categories. I really appreciated the banana plug connections in the back. Performs as expected. Good FM sensitivity. Setting presets somewhat complex but otherwise easy to install and use. All was as it was advertised to be. The TEAC AG-790A Tuner/Amp was well packaged, easy to set up and operated perfectly with minimal research in the manual. The RCA hookups on the back all work well and provide an amplifying solution for the AM/FM tuner, my satellite TV HiDef DVR, DVD/CD player and computer, (through the Phono input). All my iTunes Library is now available in big sound. The radio reception, with an addition doubling of the antenna wire, is clear as a bell and reaches even remote stations. The stereo sound is clear and without hum, buzz or noise, and carries my forty year old heavy wood cabinet speakers without strain. Hooking up the speakers was okay, but the connections are a bit close together. My big fingers needed a bit of pre-teen help to manage them. I was a bit taken aback by its size, but it had the exact dimensions specified in the ad; I just had not paid any attention to them. Only slight re-arrangement of my stereo cabinet was needed, however, and I am completely satisfied. My house now has sounds again. I thought the TEAC AG-790A stereo receiver was a good price for the quality I received. Installation was simple, its function are with ease of use and, of course, I find the remote very handy. I would recommend this item for purchase.